People always say that one man’s trash is another man’s treasure, and nowhere is this more true than in Manhattan. You might cringe to learn that I once pocketed a slightly distressed but relatively clean Longchamp bag sitting on top of (not inside) a garbage can in the stairwell of my apartment building. A frequent carry-on and beach tote, these days I use it to to store my camera equipment. 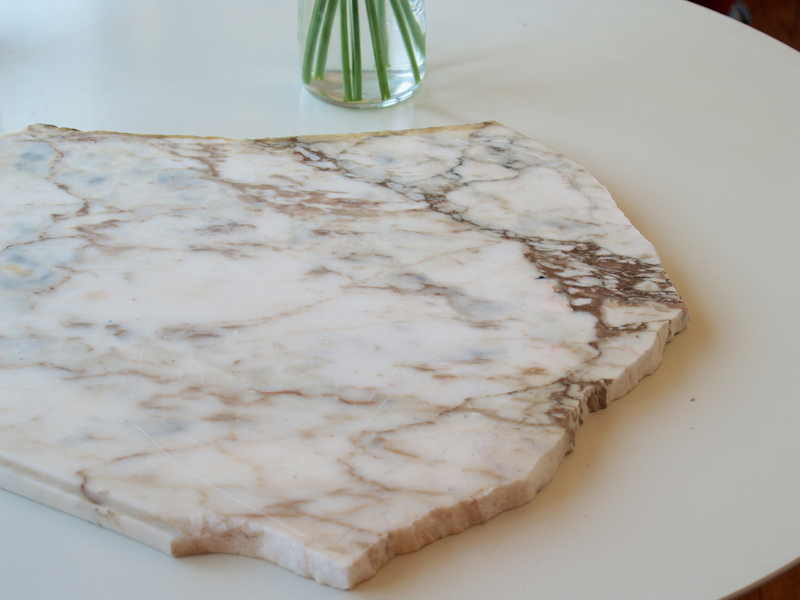 It should therefore be no surprise that when I spied a slab of white and brown marble peeking out from under a huge pile of black trash bags, I had to investigate. I pushed aside the bags to find a jagged 3-foot square-ish piece of table top (the wooden frame was precariously perched a few feet away). Score! I brushed off the monstrosity, balanced it against my hip, and teetered on home. After weighing the marble at home (28.8 pounds! ), I inspected my find. Jagged edges that can be smoothed out with a little clear nail polish. A few knife marks. Some crayon drawings. A little scrubbing and a dip in the bath tub later and the slab was gleaming. Or at least as gleaming as a chunk of marble salvaged from the maws of a garbage truck can be. 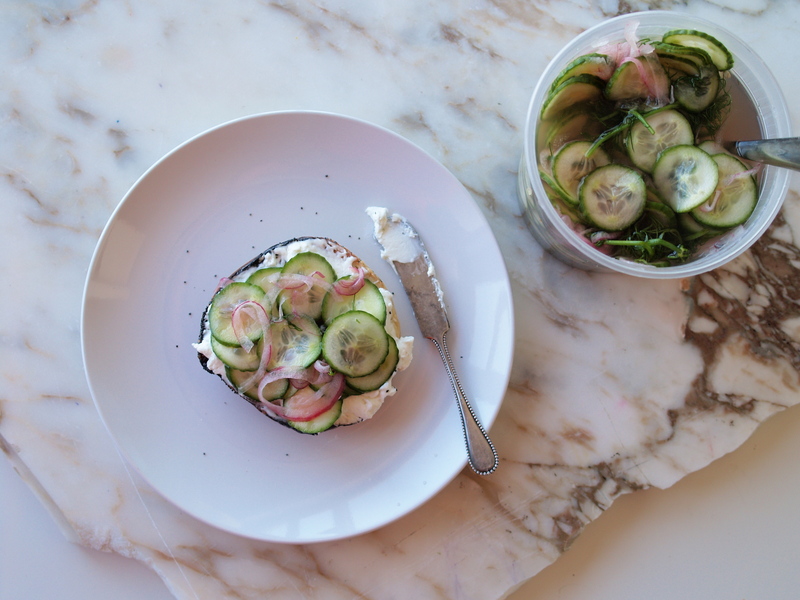 This morning I recruited my treasure for a photo shoot of an unassuming cucumber salad. The salad actually started as ice water. During yesterday’s busy brunch, there were no extra glasses for staff, so I grabbed a quart container from the dishwasher. I filled it with ice and flooded it with water and carried it with me the rest of the day. I joked with one of our managers that I felt like a true restaurant person drinking from it like I’d seen all the cooks do and she warned me to always sniff a container before taking a swig to make sure it doesn’t smell like onions. When I got home, I rummaged through my drawers and found my own stack of quart containers. I sniffed one – all clear. I grabbed an onion, a handful of cucumbers, and the last vestiges of dill hanging out in my refrigerator. A few swipes over the mandoline and the container smelled like onions. After an overnight vinegary bath, the cucumbers were ready for prime time. I piled them onto a cream-cheese smeared bagel, and sat down to breakfast. I drank my coffee out of a mug. Because I don’t go back to the restaurant until Wednesday. This salad is a quick overnight pickle that won’t last much longer than a few days in the fridge. Layered on sandwiches, piled atop greens, or just stabbed with a fork, these cukes are refreshing, light, and ready for a picnic. 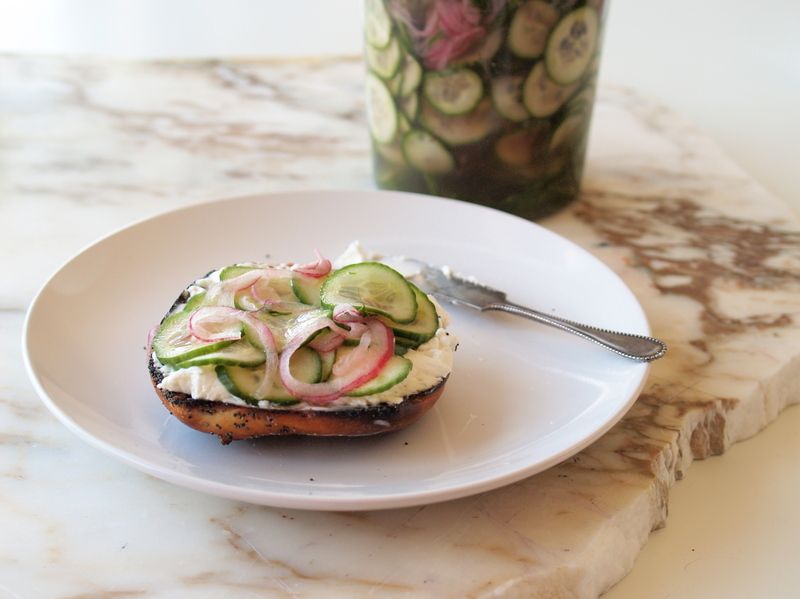 Slice the cucumbers and red onion as thinly as you can – I used a mandoline. 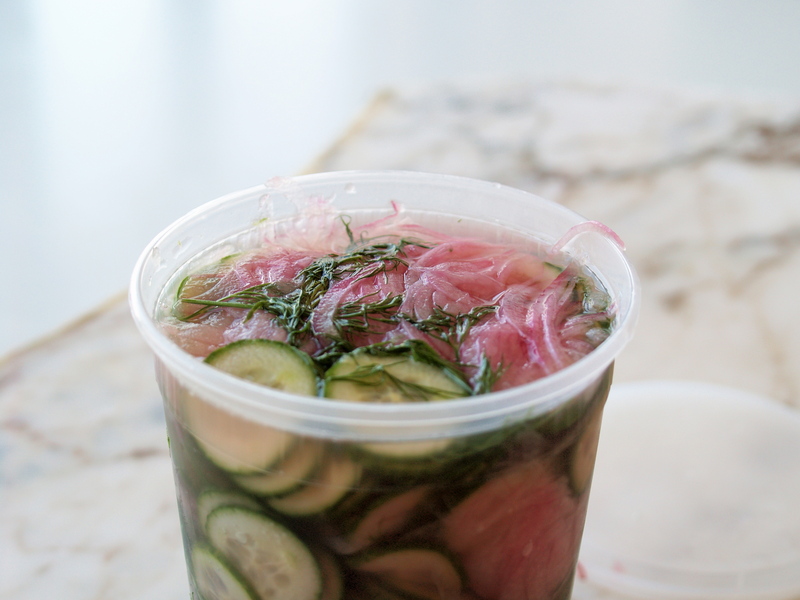 Layer them in a quart container with the dill fronds. In a covered pint container, shake together the remaining ingredients until the salt and sugar dissolve. Pour the liquid on top of the vegetables, cover, jiggle, and refrigerate overnight. 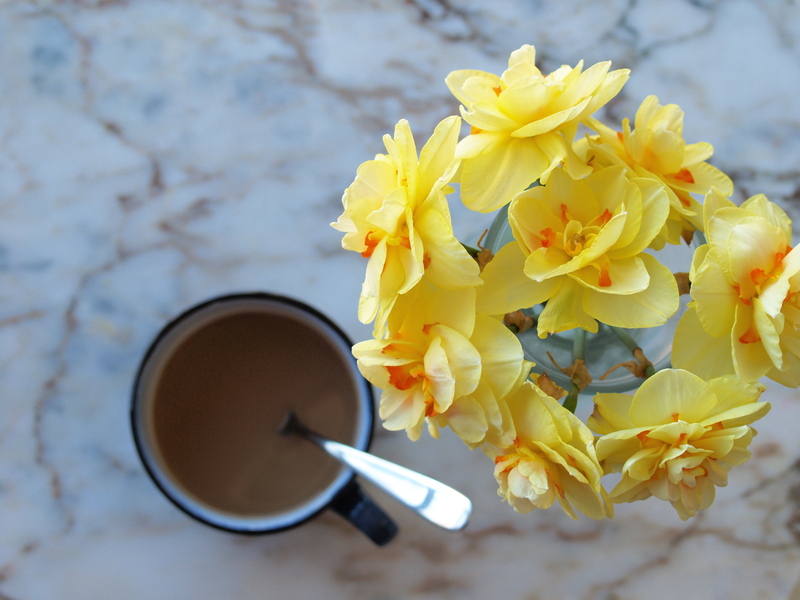 ps – I’m loving these daffodils from Dutchmill Gardens at the Union Square Greenmarket. Also, blue-tinged tulips. I can’t remember the last time I bought matzah. Other than the seder feast preamble Hillel sandwich with its dab of bracing horseradish and spoonful of sweet apple and nut charoset nestled between two mismatched shards or maybe a few snapped rectangles smeared with Temp Tee and draped in smoked salmon the next morning, I largely stay away from the stuff. Every year, as I rush from my aunt’s house where we have the seders to the car/train station/airport, I grab whatever open box of matzah is on the kitchen counter and stuff it into a bag along with leftover ribeye and a few quarts of my mom’s matzah ball soup (more on that later). My first morning back in the comfort of my own kitchen where I can make as big a mess as I want, I crumble a square or two of matzah into a bowl, scattering crumbs on the floor like a culinary Hansel and Gretel. 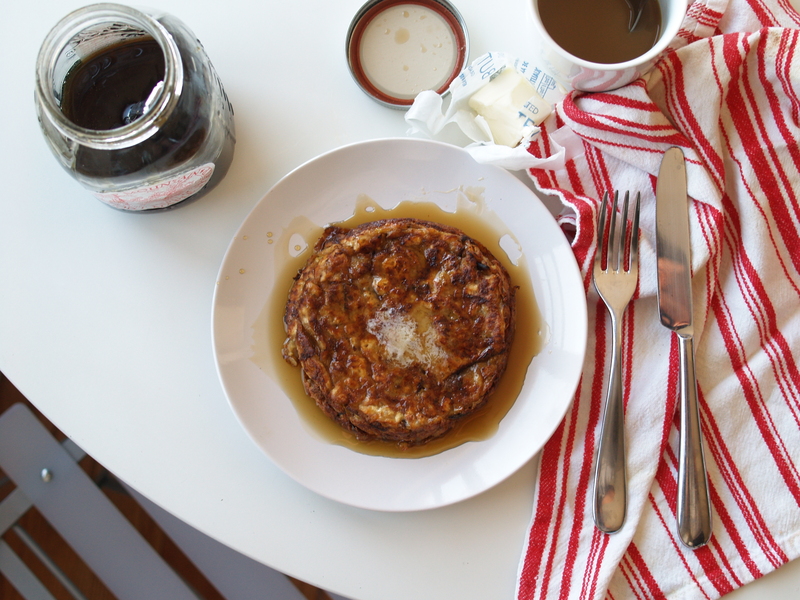 Soaked in water, mixed with vanilla, milk, and an egg, and then fried, the matzah becomes brei, Passover’s answer to French toast. This is the breakfast that dreams are made of. It’s also what leaves me every single year facing the last few days of Passover with an empty box of matzah shards and an addiction-like need to make just one more batch. Or two. Or three. It’s what sends me out, year after year, foraging the grocery shelves in the shrinking Passover section for a new, shrink-wrapped, full box. More well-hidden than the afikoman (I found ours this year under the tablecloth), the mid-holiday box of matzah is elusive, assuming you don’t want the only flavor left: wheat bran. And no one wants that wheat bran straggler. Unless I can borrow a few squares from a friend or neighbor, after a breakfast or two or three, I say bye-bye to the brei. And wait for Passover next year. ps – If radiology was like this, I might have stayed in medicine. 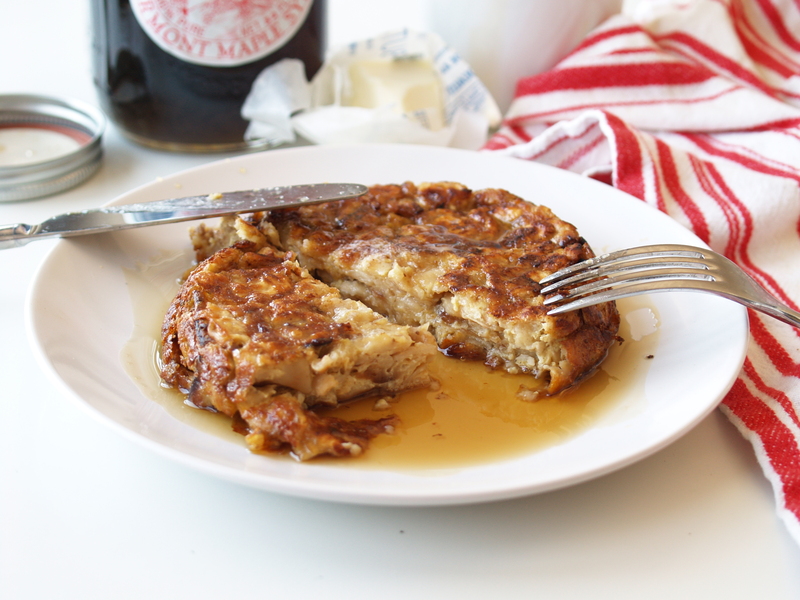 This recipe makes treats matzah like French toast and makes a brei that looks like a big pancake with a nice browned crust, rather than a matzah scramble. While some like it savory, I take my brei sweet and add a fair amount of vanilla to enhance that sweetness. I don’t have real measurements other than one square of matzah and one egg per person. I have a teeny tiny pan that works perfectly for one person. 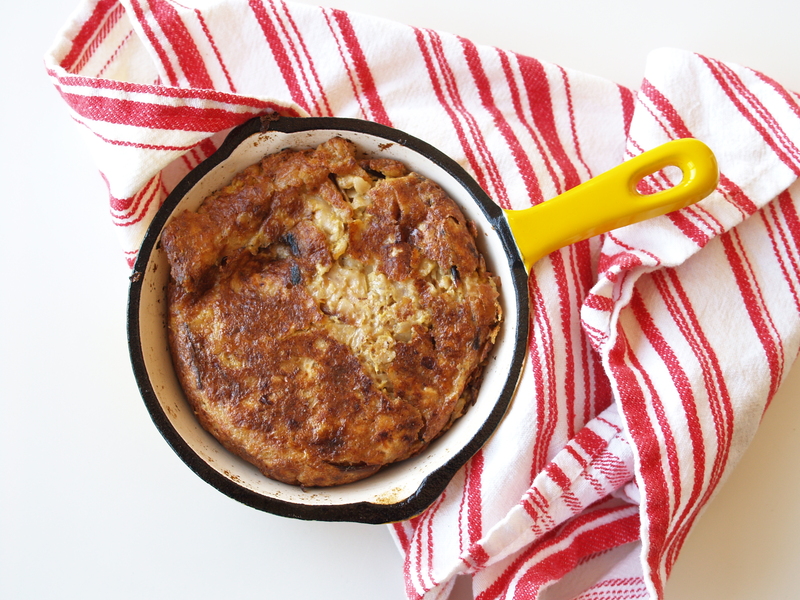 You can also use a larger pan and pile the brei into small mounds (think pancakes). Or, make a huge brei to fit a large pan and invite friends over (use a plate to help with the flip). 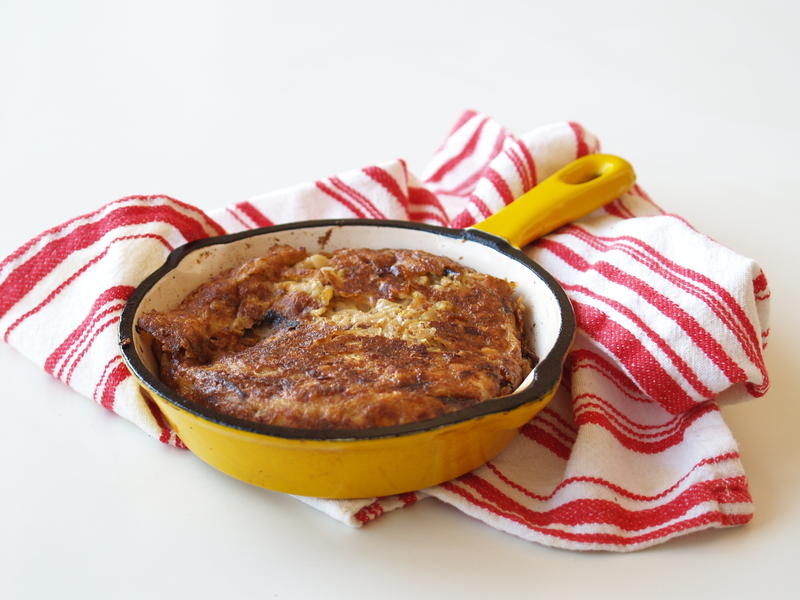 Crumble a square of matzah into small, but not tiny, pieces (about ½-inch wide) and place in a small bowl. Pour boiling water over top and allow to soak until the water cools enough so you can handle it. With your hand, cover and push the matzah against one side of the bowl and drain out as much of the water as you can. Mix in a splash of milk (1-2 tablespoons), a dash of vanilla (1-2 teaspoons), a pinch of salt, a sprinkle of cinnamon (optional), and an egg. With a fork, mix everything together. Generously coat a small pan (small enough so that the brei batter will fill the entire pan, about a half-inch thick) with olive oil and heat over a high flame for a minute or two until hot, but not smoking. The hot pan will help the brei develop a nice Drop the batter into the hot pan and distribute it evenly. Turn the flame down to medium. Then, do not stir it. You don’t want scrambled brei – you’re aiming for a large pancake. Peek under the brei periodically until you find it nicely browned and flip-able, loosening it from the pan a little bit at a time. This will take longer than you think, probably about 7-10 minutes. Yes, that long. Carefully flip the brei in one piece and continue to cook until browned, another minute or so. 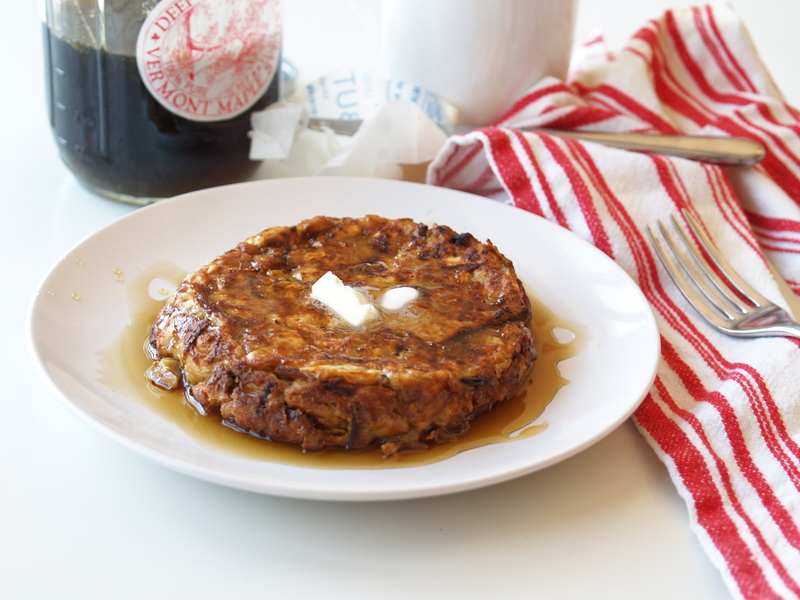 Slide the brei onto a place, top with a drizzle of maple syrup and a pat of butter. I don’t work on Tuesdays or Wednesday mornings. Which means that after a few double shifts landing me in bed no earlier than 1 am, I let myself indulge in a more leisurely morning or two: I sit down to a hot breakfast. This past Wednesday, I woke up and did a little not-yet-ready-to-wear-my-glasses-or-contacts bleary-eyed on-my-phone reading, coming across this article about Mitchell Davis. Executive Vice President of the James Beard Foundation and host of Heritage Radio Network‘s Taste Matters, Davis makes the matzah ball soup for the James Beard House’s annual seder. The finishing touch to his recipe is dill. Dill is the smell of Passover in my book. 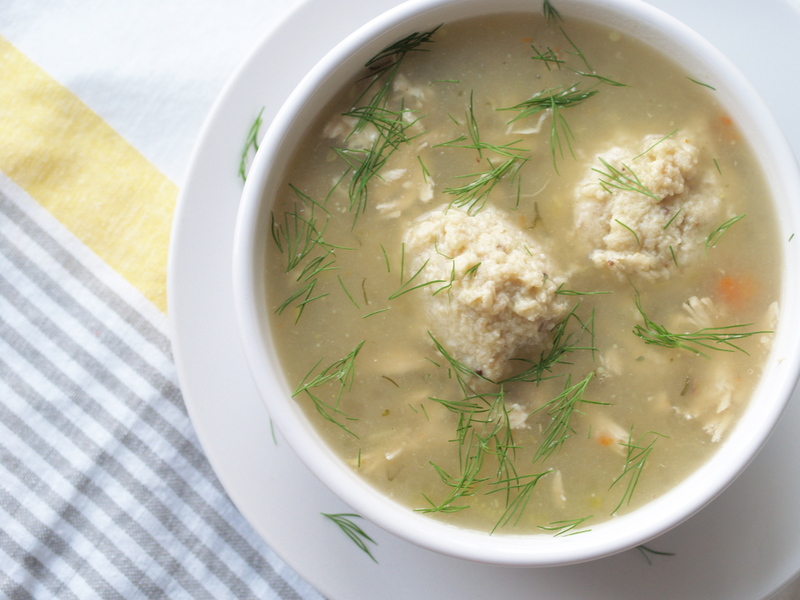 My Bubbie used to order our entire seder feast from a caterer, but she made the matzah ball soup her own by dropping in a fistful of dill, stems and fronds and all, as she reheated it. When I was tall enough to reach the stove, she periodically let me escape from our round robin hagaddah reading to stir the soup. Scampering to stand on the pink plastic-upholstered seat of a black wrought iron kitchen chair, Bubbie protectively behind me, I’d remove the lid and breathe in the first rush of dill-tinged facial-strength pore-opening steam. I must have had Passover on the brain when, Sunday night after a double shift, I popped into a grocery store at a few minutes before midnight to pick up some greens. As an afterthought, I grabbed a fat bundle of dill. Home, I stuck the bouquet of dill into a glass of water and placed it in the fridge door. Fast forward to to Wednesday morning: me, lying in bed with my phone mere inches from my trying-to-focus eyes, reading the article about Davis’s soup. I plucked my glasses off the nightstand and stumbled towards my brewing coffee. (Thank god my coffee maker has a timer.) As I pulled open the fridge to grab the carton of milk, the dill brushed my arm and I caught a whiff. I spied some leftovers and, a few slurps of coffee under my belt, I channeled my inner Tamar Adler into a breakfast bowl. I had made a kale and freekeh* salad the day before, so I scooped up the kale ribs that I had set aside and threw them into a pan with some oil and a rough chop of dill. I mixed together some freekek and kale leaves with the sautéed ribs, slid an egg on top, and showered the whole thing with more dill. 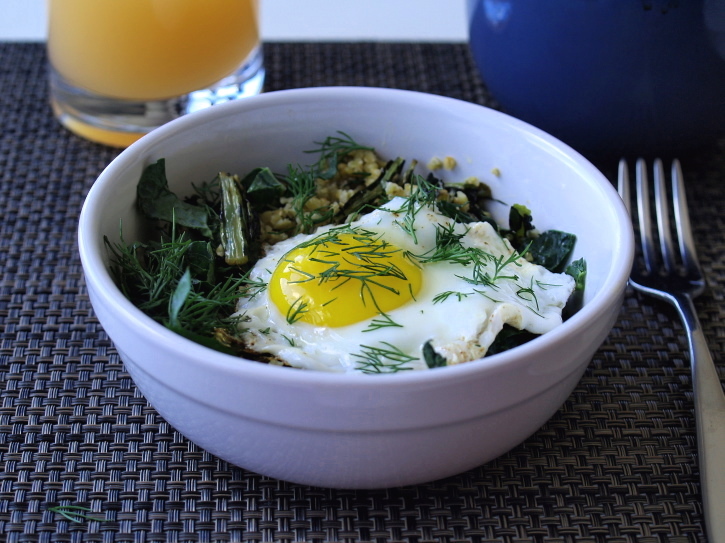 My basic breakfast bowl combo is an egg perched atop a pile of cooked or raw greens, grains, and herbs – pretty much whatever you have lying around. Swiss chard and arugula are some of my other go-to greens, and you can’t beat parsley or cilantro to top everything off. Rescue kale ribs from your most recent salad. Saute them with a large pinch of fresh dill in a little bit of olive oil for a few minutes, then cover the pan to allow the tough stems to steam a bit. When the ribs are tender and the greens are a little browned, season with a sprinkle of salt and a squeeze of lemon. Move the kale ribs to a bowl. 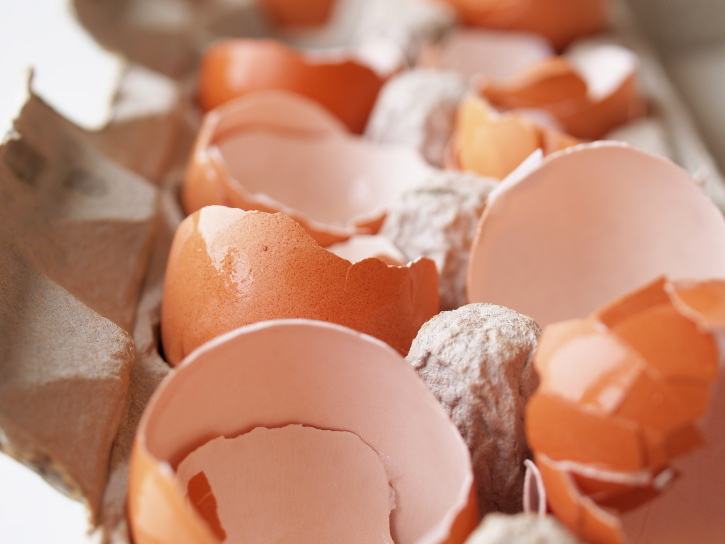 Crack an egg in the same pan and cook it however you like. 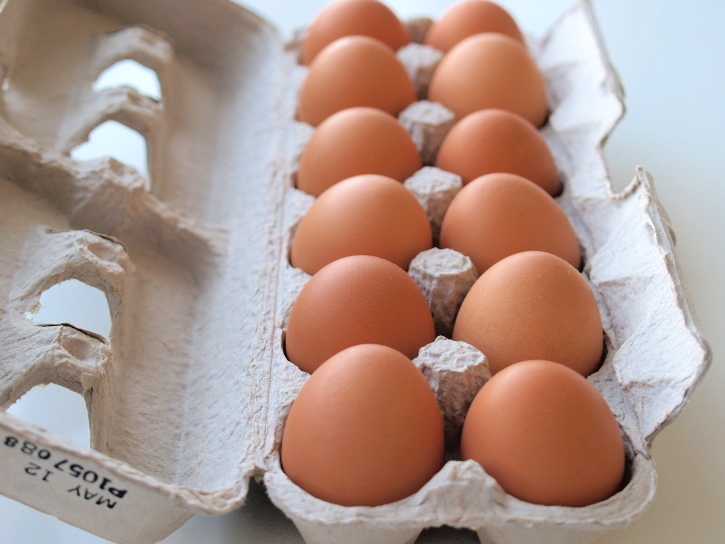 I fry my egg up so the edges are are frilly and browned and the yolk stays liquid. 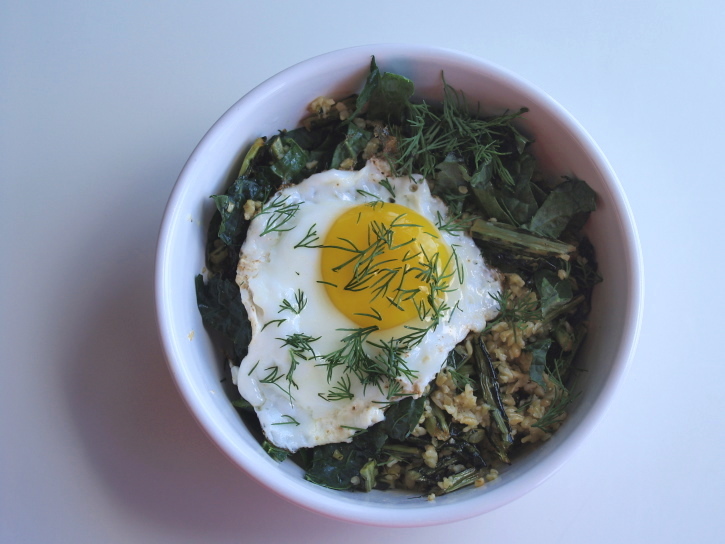 While the egg is frying, mix the warm kale stems with a few spoonfuls of leftover freekeh and a handful of shredded kale leaves. Top with the egg and some more dill. Sit down and enjoy, even for a few minutes. * OK, let’s talk about freekeh, folks. Some couples have a song. My friend Molly and I have a grain. I met Molly at a cooking demonstration where she was the only person who could identify the picture of a pile of green grains. We instantly bonded. Common throughout the Middle East, freekeh is an immature (“green”) wheat harvested early when still soft, then dried and set afire in a controlled blaze, lending a smoky flavor to the wheat. It’s name comes from the Arabic farik – rubbed – because after the grains are roasted, they’re thrashed together to separate them from the burnt chaff. Feekeh has an earthy, grassy flavor that I think needs to be tempered a bit with a little lemon juice; it smells a little bit like green tea. For more info and ideas on cooking with freekeh, I’d head on over to Maria Speck‘s Ancient Grains for Modern Meals. Whew, it’s been a while, hasn’t it? It sure has been hectic on my end. Between a new apartment and a new job and a whole bunch of travel and an asthma-inducing sleep-interrupting cold, I’ve had a hard time getting back here. While out of site (get it? ), this little place was never out of mind. 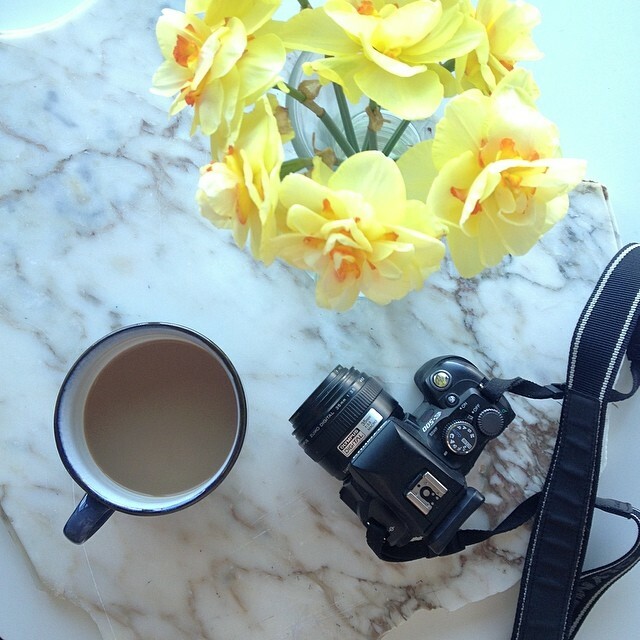 Don’t worry – I’ve finally organized my kitchen and I have a queue of recipes and photos just waiting to flit across these pages. The next few pre-Passover days should make up for lost time. Earlier this year, I started working front of house at Union Square Cafe. Learning in the restaurant that anchors all of Danny Meyer‘s work is a phenomenal experience and I’m punch drunk on the “enlightened hospitality” kool-aid. Perhaps it’s the novelty of a new direction for my life, but even aching feet after long hours in the dining room can’t dampen my spirit, particularly now that I re-invested in what I used to call hospital shoes. Drop by, say hi. I’ll probably be there welcoming you into what has increasingly become my second home. Eventually, I’m hoping to do a mini-trail in the kitchen, but for now I just pepper Chef Carmen and pastry Chef Sunny with questions. Case in point: this year I’m in charge of our Passover seder desserts. In the past, I’ve made Jess’s chocolate hazelnut mini cakes, substituting margarine for the butter. One year I made a quadruple batch which yielded eleven dozen one-bite cakes. That’s 132 bites that disappeared over the span of a few short days. Wanting to avoid margarine this year, mostly because my restaurant schedule makes it difficult to get to a kosher grocery store, I picked Sunny’s brain for some suggestions. I was thinking coconut oil, but she suggested grapeseed or olive oil. And while we were on the topic, she mentioned that she’ll be making dairy-free, gluten-free macarons and macaroons in the restaurant over Passover. We chatted about different flavors – pistachio? citrus with jam filling? – and I can’t wait to see what she comes up with. More on that when I get the intel. I channeled a little Sunny today and tested Jess’s mini-cake recipe with olive oil. The olive oil has a more complementary flavor than margarine, letting the dark dark chocolate shine and keeping the bites dense without heft. The hazelnut enhances the chocolate instead of turning the cakes into nutella wannabes, and the sprinkle of salt – well, you can’t go wrong with a little salt. I’ll see what Sunny has to say tomorrow when I bring them in for her to try. Good night, all. See you back here real soon. Update 4/9/14: Success – Sunny likes them! Update 4/12/14: These work with almonds as well, though they’re a little less rich. See below for recipe modification tips. Adapted from Jess over at Sweet Amandine who turned a flourless chocolate cake from Gourmet into mini cakes. In order to make these non-dairy, I substituted 6 tablespoons extra-virgin olive oil for 1/2 cup butter. 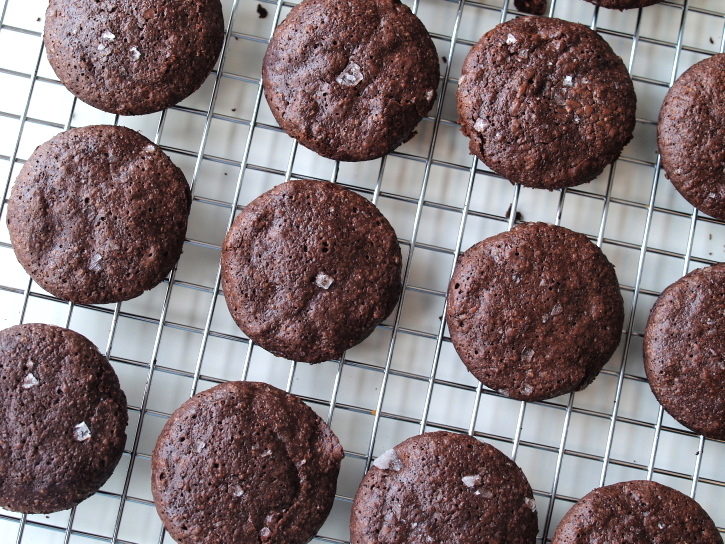 Use a mild olive oil – no need for the fancy stuff here – and splurge on chocolate and cocoa. I normally use Callebaut (a mix of 65% and 70%) and on Passover I lean towards Swiss brands – Camille Bloch or Schmerling’s; I heard that Equal Exchange is making fair trade kosher for Passover chocolate bars this year and I plan to seek them out. I used Cacao Barry extra brute (dutched) cocoa (Cacao Barry and Callebaut are marks of the Barry Callebaut company); any high quality 100% pure, unsweetened cocoa powder will do (and doesn’t require special Passover certification). 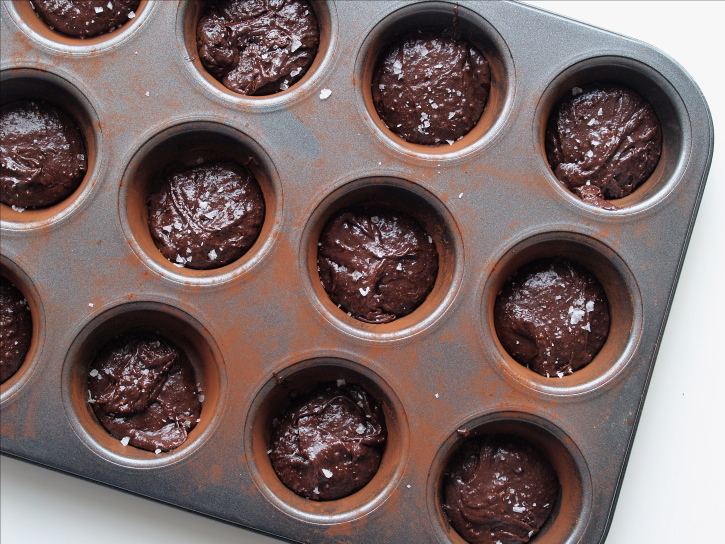 Jess recommends using a mini muffin pan, but I only one with medium-sized cups (i.e., regular-sized in this day of mega everything). I filled each cup with approximately 2 tablespoons of batter. The cakes freeze well and Jess actually prefers their consistency when frozen and thawed – I agree, so you can prepare these well advance. Update 4/12/18: These work with almonds as well, though they’re a little less rich. If you are going to use pre-ground almond (or hazelnut for that matter) flour, measure out 60g which is the same weight as 1/2 cup of whole nuts. If you only have volume measurements, it will be a bit difficult to do this conversion, but I found that if you fluff up the nut flour with a fork, it’s just under 1/2 cup. If you compress the nut flour, it’s a little over 1/4 cup. Prep. Preheat the oven to 375ºF. Generously oil a 24-cup mini muffin pan or two 12-cup regular muffin pans. Dust with cocoa powder, tapping the pan to coat all surfaces, and then shake out any excess. Skin. Toast the hazelnuts in the oven for about 8-10 minutes until fragrant and slightly darkened. 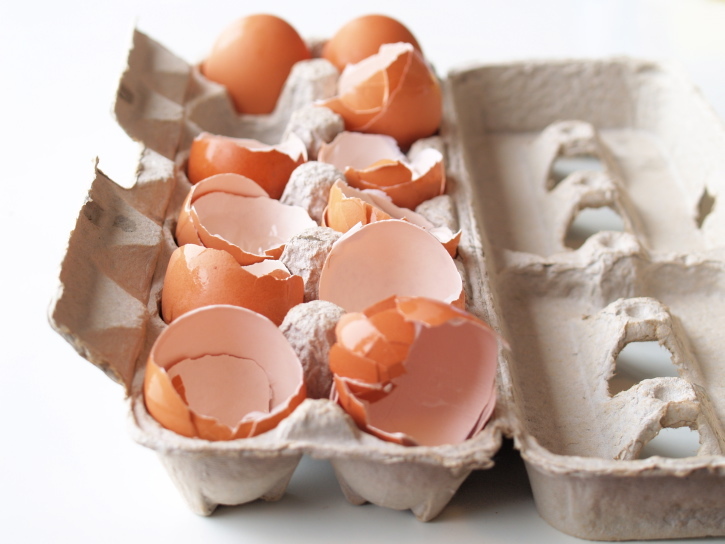 Pour them into a container, cover, and shake (see the second photo above) – the agitation will help remove the loose skins. Hold the top on because it may pop off due to the heat of the nuts. Separate the nuts from the skins and allow them to cool fully (I put them in the refrigerator). Grind. Once they have cooled, grind the hazelnuts in a food processor until fine. 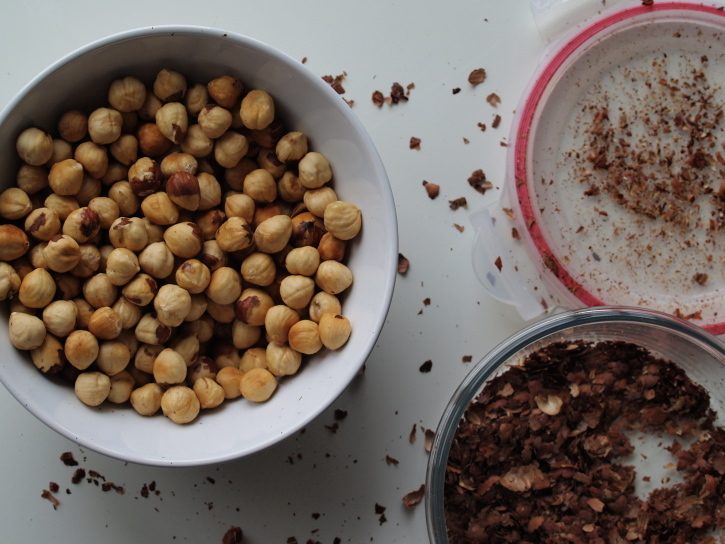 Make sure to use quick pulses to avoid making hazelnut butter. Melt. Chop the chocolate into small pieces and melt it together with the oil in a large bowl placed over a pot of barely simmering water. Stir until smooth and remove the mixture from the heat. Whisk. Whisk in the sugar – it will be a little bit grainy. 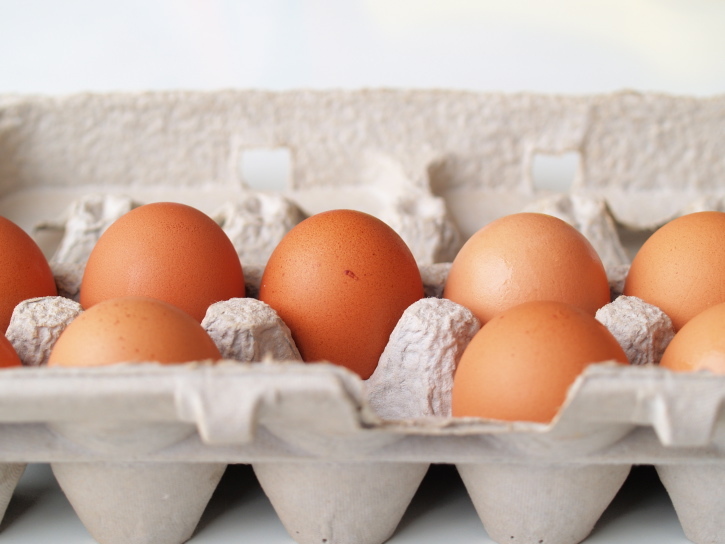 Allow the mixture to cool for a few minutes and then add the eggs and whisk well. Sprinkle the cocoa powder and the ground hazelnuts over the chocolate mixture and whisk until just combined. Sprinkle. 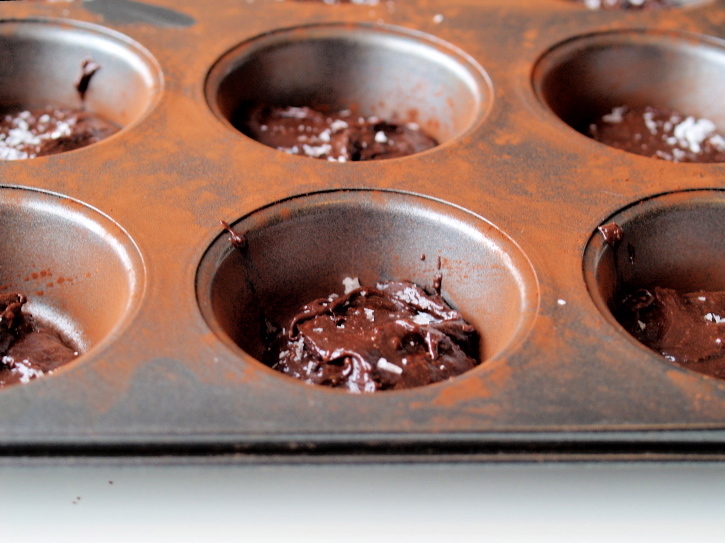 Pour the batter into the pans, 2 tablespoons per muffin cup, and tap on the counter to remove any air bubbles. Sprinkle with salt. Bake. Bake for approximately 12 minutes until the cakes have puffed up and the tops have formed a thin crust. Start checking at 10 minutes. Cool in the pans on a rack for five minutes. Slide a thin knife (I use a narrow offset spatula) around each cake to help nudge them out of the pan. As they cool, the cakes will fall a little bit. Serve warm or at room temperature.